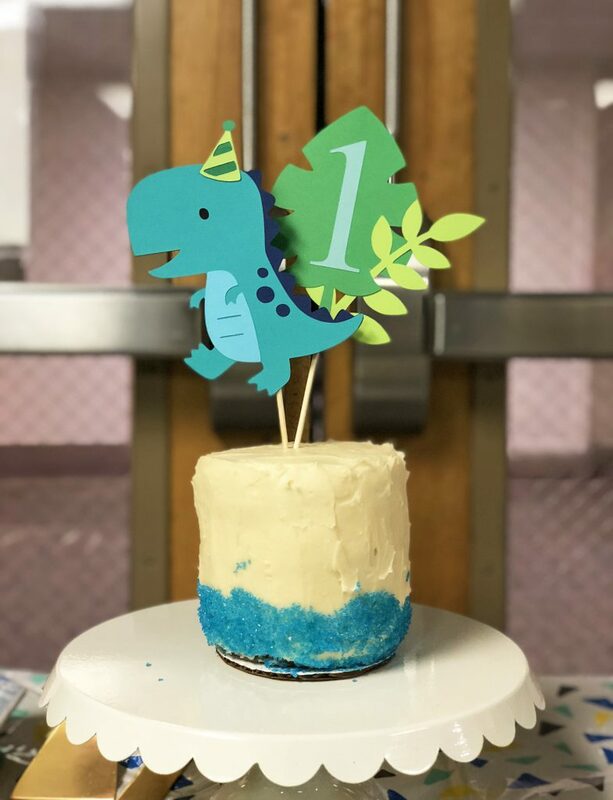 I know people say not to go crazy for the first birthday because your child will never remember any of it, so it’s not worth the stress, time or money. I say, do whatever you want! I believe the first birthday is more for the parents anyways — maybe even mostly so, for the MOM! We’ve made it out the first year and survived!!! And at the same time, we want to show you how much joy you’ve brought to our lives, how much we love you, and how lucky you are to have great family & friends in your life. So why not, let’s throw a party! My son Jackson, was born on February 25, 2017 during a very wet and rainy winter. We knew birthday parties in the future would be tricky! Without being able to control the weather, we knew it would be too risky to have outdoor or park parties. And we also didn’t want to cram a ton of people into our small home. So we decided to rent a private party room at Habitot Children’s Museum in Berkeley! We knew we would have a wide range of friends with kids from the ages of 4 months to 8 years old, so it was the perfect place for the kids to run around and the adults to have a private room off to the side. It also gave us this great big space to play with! 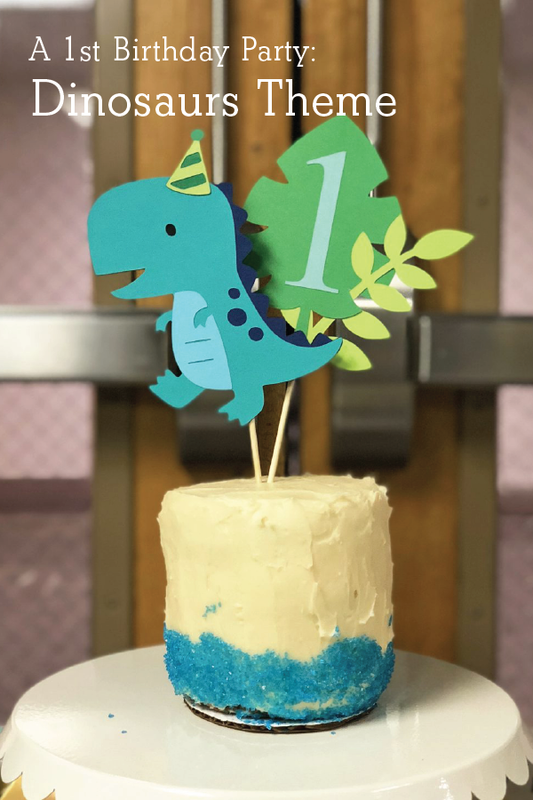 Once the venue was selected, I used good ol’ Pinterest to help find cute boy themes and just happened to land on dinosaurs. It was a great theme with a bright color palette and the ability to flex through decor, snacks, and gift bags. I love to DIY and use any excuse for arts and crafts, so I decided to make a lot of the decor myself. Face banner w/party hats – unfortunately, I can’t take credit for this amazing banner as a few of my friends did it for their own kids. We printed out a bunch of different pictures of Jackson from throughout the year with all different facial expressions. We then cut out just his face and glued on triangle-cutouts from construction paper using different colors and prints. (Pro Tip: you can also buy those pads of pre-cut triangle banner pendants from Michael’s to make life even easier!) Then I just used a hole puncher to put holes on the top of each hat and then strung them together to create a banner. It’s best to get a bunch of good laughing, smiling faces in there, but also some crying or yawning to mix it up. It was a hit at our party and everyone laughed at all the different Jax faces! Goody bags – we made it easy by using brown lunch bags sealed with custom designed dino stickers. 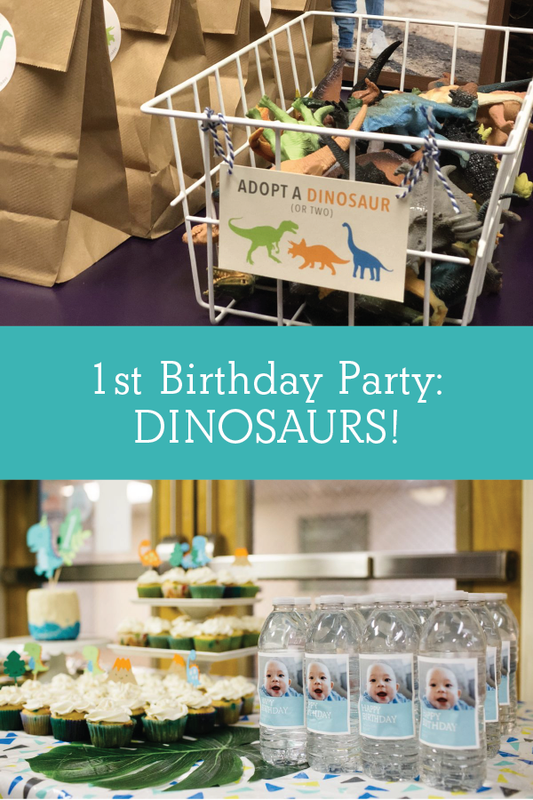 Inside each goody bag, we placed bubbles, dino coloring book & crayons, dino temporary tattoos, play doh and some dino gummies. 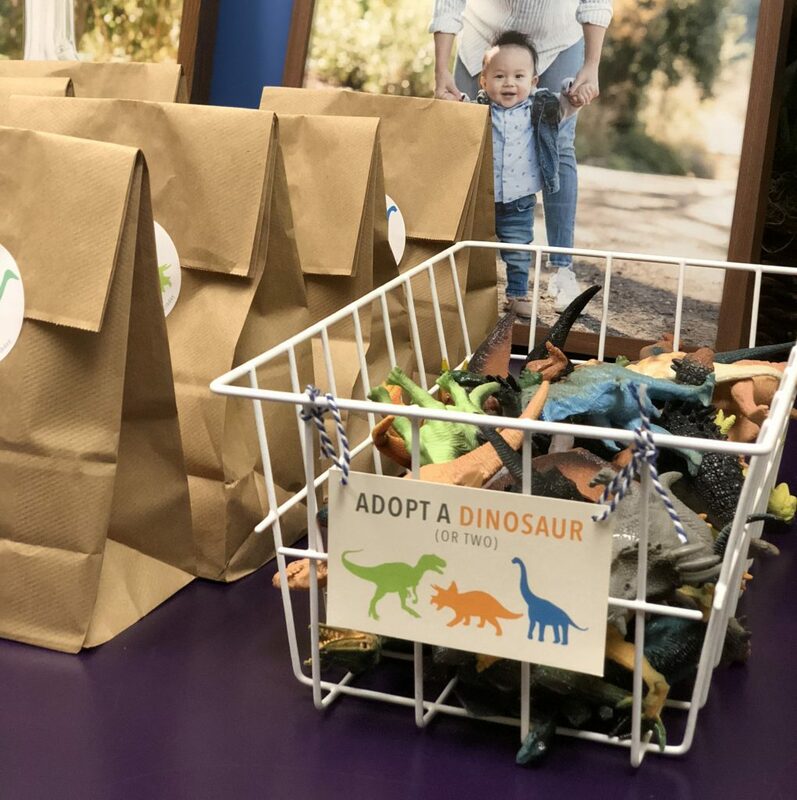 Adopt A Dino – we also had a small basket at the exit with an assortment of different dinosaur figurines with an “Adopt a Dinosaur” sign. It was great to see the kids running around at the end of the party all playing with their new friends! 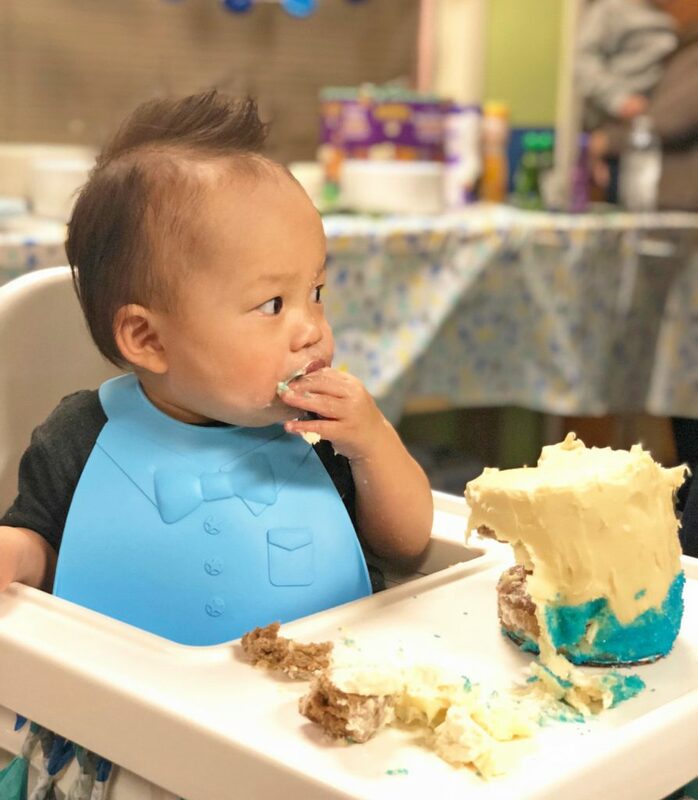 Cake – every 1st birthday must have a smash cake! I decided to make my own for Jackson so that I would know it wasn’t too sweet. I used this recipe to make a healthy banana, apple cake with cream cheese frosting. The cake was a little dense and we did three layers. It probably would have been fine with just two. Jackson is a bit timid and didn’t dive into the cake right away, but once we fed him a few pieces, he went to town!! 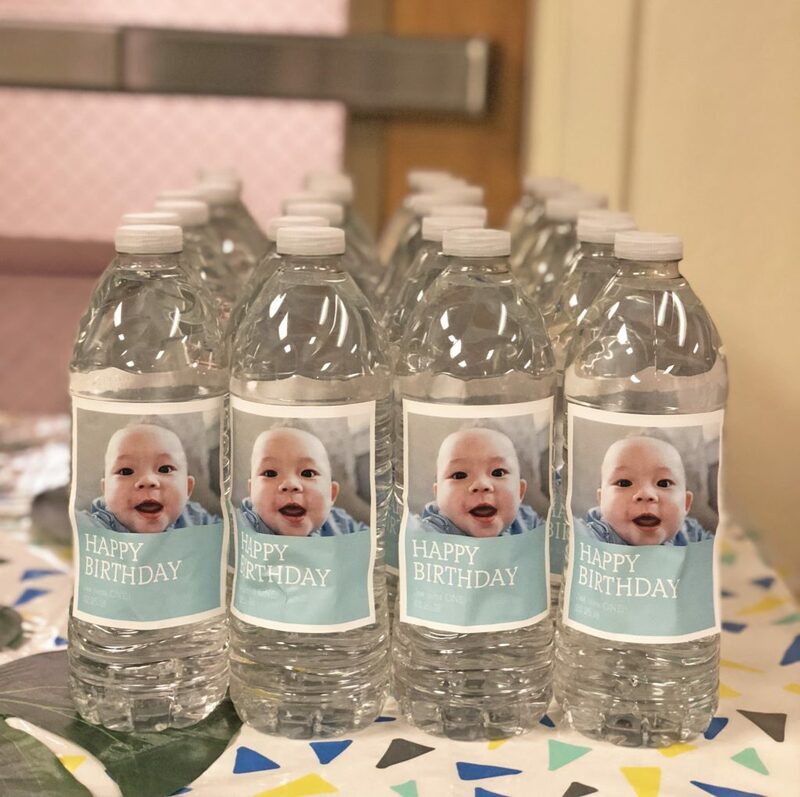 Water bottles – a fun way and easy way to brand your birthday party is by using the great bottle labels from Pinhole Press. We just bought a case of water and peeled off the labels, and then stuck these stickers on top. It was so easy and also a great hit and talking point of the party. 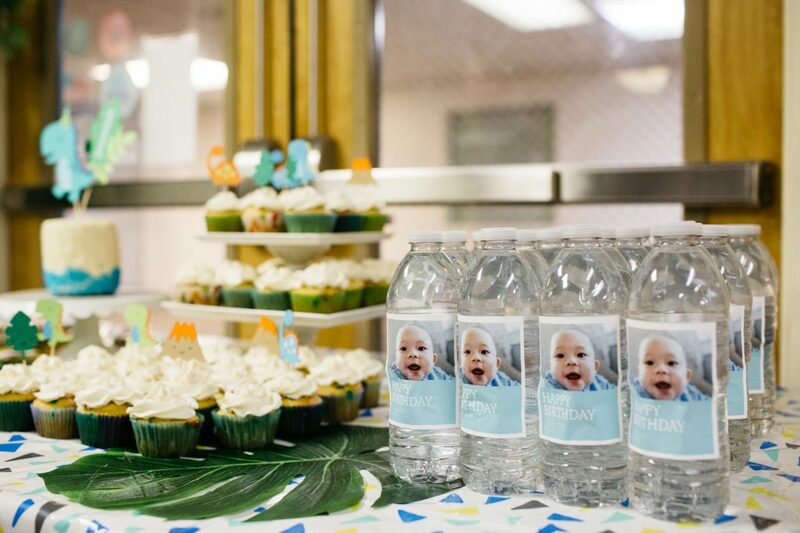 Who wouldn’t want personalized water bottles?! Overall, the party was a huge success! The museum was a great place for the kids to explore and play in the different exhibits. Jackson especially loved the train tables and the mini grocery store with shopping carts!! The private party room was down the hallway and was a great place for the adults to hang out, chat, and eat food. It was so great to have all of our close friends and family together, and see how much love our son is surrounded by. We truly couldn’t have asked for a better time. Make or buy your decor – honestly, whatever makes things easier for you! 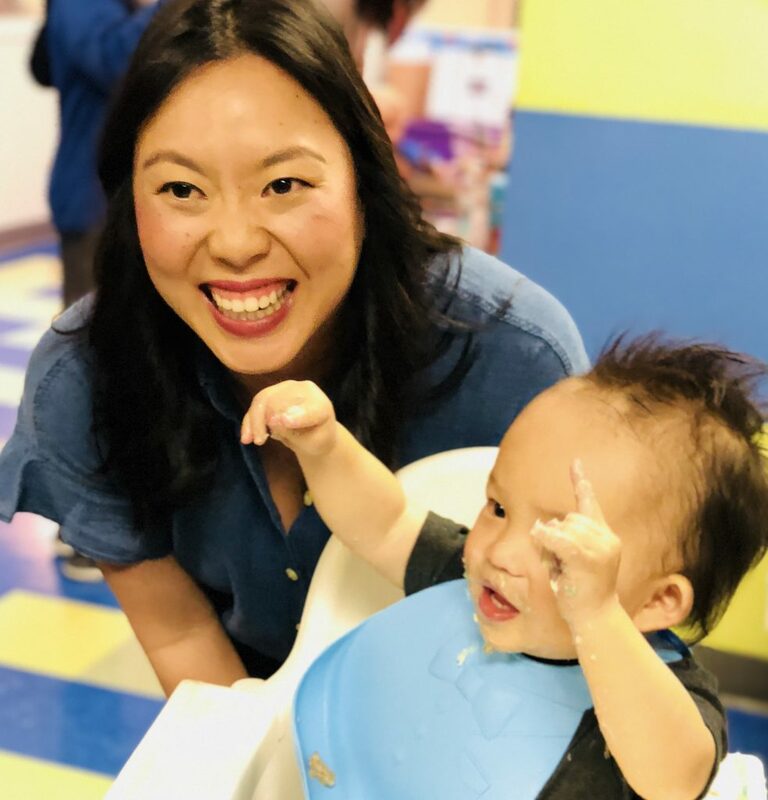 Try to find time to enjoy some 1:1 time with your child during the actual party. We got so caught up with chatting with friends, that I had to make an effort to take Jackson through the museum for 15 minutes and made sure that my husband got to too. At the end of the day, it’s still about you and your lil one, so make sure you dedicate some time (even if it’s short!) to celebrate together. Your kid will cry. And if he/she is anything like Jackson, it’s going to be during the cake. It’s ok though – makes for great & funny pics! It will be stressful, and the party will be over before you know it. But it’ll still be worth it. And on that note, Happy Birthday, Jackson! We love you!! Emily Fong is mom to Jackson, 16 months and Kitsu, a 5-year-old Shiba pup. When she is not planning parties for her family, she is Director of Campaigns for Sephora, while living in Bay Area, CA.